Anyone who wants to get a feel for life and death in one of the deadliest valleys in Afghanistan need look no further than filmmakers Tim Hetherington’s and Sebastian Junger’s chronicle of Second Platoon, Battle Company, 173rd Airborne Brigade’s 14-month deployment in the Korengal Valley (which began May 2007). The film’s title is a homage to Juan “Doc” Restrepo. The amiable soldier is seen cavorting with his buddies on the overseas flight into the struggle for “hearts and minds,” but soon becomes the first causality—his long-nail, flamingo-savvy hands never to strum again. Captain Dan Kearney stoically helps his “boys” get through this early loss. 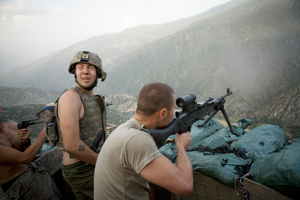 Their deadly assignment is to build an outpost on top of a rugged spur to afford a better view of the enemy below. They decide to name it after the fallen medic. In the early going, the squalid holes-in-the-ground seem more insult than honour, but as the months go by and the mini fortress (just 800 metres from HQ—“The Kop”) begins earning its keep as an effective shooting gallery, a sense of pride can be felt for O.P. (Outpost) Restrepo. As is too often the case, called-in air strikes hit their targets but, simultaneously, kill, wound or maim those whose only crime against the freedom fighters is being born in the wrong place. Seeing these dead and wounded laid to rest or patched up mightily explains why the Afghans and their “liberators” are filled with as much desire for swift revenge as the Americans. 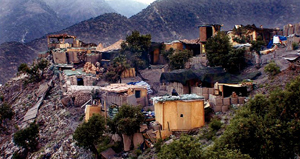 At the weekly shura with the local elders, Captain Kearney (through a translator) tries to buy the support of the wary populace with visions of riches once a truncated road (Taliban as the impediment) is finished, opening up a more-efficient trade-route to the Peshewar Valley. “You will be flooded with money, projects and health care,” explains the negotiator. However, when past atrocities are mentioned by the grizzled leaders, a simple, all-encompassing remedy is offered: “Let’s put the past behind us.” It’s as simple as that. But if that diplomatic medicine was administered on both sides, would there be any need for war at all? Spliced between the filmed battles, r&r (boys being boys whether wrestling, dancing up a storm or telling much-enhanced tales about each other) and meetings there is a series of interviews with surviving members of the brigade from Italy—the first stop on the way home after their tour ends. The extreme-close-up technique allows viewers to look directly into the hearts and souls of these men who—now—are safe from external attack but battling even worse adversaries in their own wretched memories and nightmares. There is little feeling of satisfaction about what has been achieved except an admission that their assignment was completed: the outpost was built. As the camera cuts back and forth between the studio and theatre of war, a more chilling feeling develops for these men who have risked their lives for their country. The absolute joy of sighting the enemy then hitting him with so many rounds that the “body parts are falling off” is difficult to hear; “I wish they were closer [so that I could see] them when I kill them” is even more disturbing, if sadly understandable.